Dhaka, 5 July, Abnews: Newly elected mayor of Khulna City Corporation and councilors took oath at a function at Prime Minister’s Office (PMO) in the capital on Thursday. 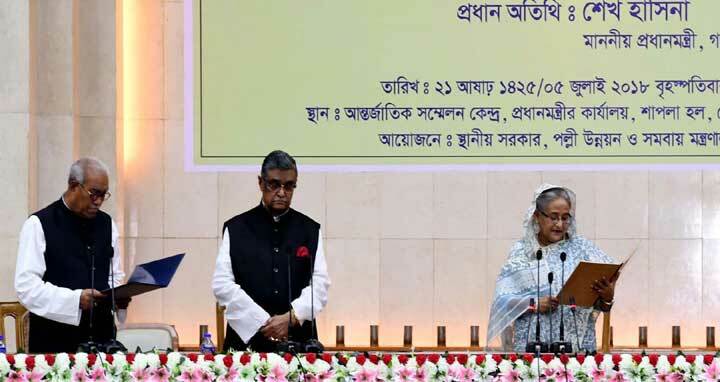 Prime Minister Sheikh Hasina administered the oath of Mayor Talukder Abdul Khaleq while the councilors took oath from Minister for LGRD and Cooperatives Engineer Khandakar Mosharraf Hossain. Senior secretary of the Local Government Division Jafar Ahmed Khan conducted the oath taking ceremony. Election to Khulna City Corporation (KCC) was held on May 15, 2018.